Values of type type are used whenever a value needs to be stored, such as memory addresses, the values stored at those addresses, the values stored in registers, the operands for RISC operations, and the results of those operations. Each value has a known size and known bits. All RISC operations on these values will produce a new known value. This type is not capable of storing an undefined value, and any attempt to create an undefined value will create a value with all bits cleared instead. Definition at line 41 of file ConcreteSemantics2.h. Definition at line 59 of file ConcreteSemantics2.h. 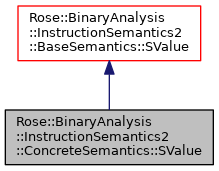 Referenced by boolean_(), bottom_(), Rose::BinaryAnalysis::InstructionSemantics2::ConcreteSemantics::RiscOperators::instance(), number_(), undefined_(), and unspecified_(). This semantic domain has no representation for an undefined values–all values are defined. Therefore any attempt to create an undefined value will result in all bits being set to zero instead. Definition at line 67 of file ConcreteSemantics2.h. Definition at line 72 of file ConcreteSemantics2.h. Definition at line 79 of file ConcreteSemantics2.h. Definition at line 82 of file ConcreteSemantics2.h. Definition at line 85 of file ConcreteSemantics2.h. Definition at line 88 of file ConcreteSemantics2.h. Definition at line 91 of file ConcreteSemantics2.h. Definition at line 94 of file ConcreteSemantics2.h. The value v must have a SymbolicSemantics::SValue dynamic type. Definition at line 108 of file ConcreteSemantics2.h. Definition at line 124 of file ConcreteSemantics2.h. Definition at line 128 of file ConcreteSemantics2.h.